Every morning, I go through my prayer ritual, or puja, to Ganesh. It involves a series of steps, one of which is lighting incense. I’ve grown quite fond of the ritual, especially the incense. It’s incredibly pleasant to have your morning coffee and write while breathing in the calming aroma of incense. Initially, I thought it was just a pleasant smell, enhanced by the fact that I have pleasant memories at my grandmother’s house in Okinawa, who frequently lit incense. 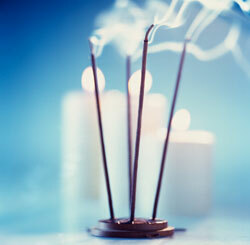 But I came across this study yesterday that shows incense may have anti-depressive effects! Researchers administered incensole acetate, a compound found in the Boswellia plant which is used to produce incense, to mice, and they found that it altered activity in the parts of the brain associates with anxiety. Perhaps this is why I feel calmer when praying to what I believe is an “imaginary” god. It’s the incense! This project has forced me to contemplate some very deep and important issues about the self, the soul, the relationships between man and God, man and others, and man and the universe. While these big issues and ideas can be enlightening, they can also be depressing. If you spend your time contemplating Hindu scriptures, for example, you’ll get the sense that nothing in the sensory world really matters. The goal is, in fact, to escape the sensory world through the various karma paths and re-unite the individual soul, the atman, with the universal soul, the Brahman. On the one hand, you have a somewhat depressing idea (the world as we perceive it is not real or important), and on the other, you have an uplifting message (you can escape this world by meditation, performing selfless duty, etc.). To get the benefits of the religion, you have to embrace it holistically. It’s not enough to just accept the view that this world doesn’t matter. That would just lead to an unending existential crisis. You have to also accept the teaching that you can do things to make your life meaningful. This is why I think it would be very hard to go the path of DIY Religion. It’s tempting to just pick and choose the pieces of religion you like, but with religion, the whole is greater than the sum of its parts. Over these past few weeks, Hinduism, to be honest, has been bumming me out. I love the big ideas, but contemplating these big ideas has put me in an existential funk (which, I admit, I’m prone to). The morning Puja and its incense burning has added a bit of pleasure and sanity to my study of Hinduism. If I had just chosen to study the big ideas, without choosing to do any of the devotional practices, it’s possible that I would just lose all motivation to do anything, and be a big depressed mess. But the uplifting act of the Puja, and the anti-depressive effects of the incense, have allowed me to continue my studies without an excessive number of existential crises. Hopefully, I’ll continue this month with the attitude that Hinduism is not supposed to be depressing, and that it really is an uplifting religion. If that doesn’t work, I’ll just snort some more incense.